HOW MUCH TIME FOR SCIENCE ON MARS? We go to Mars to explore, to understand, to pave the way for future missions, to determine potential resources, and define the possibility for settlement. All this activity will be research-based. The question is, how much time can be spent of research? In particular, how much time can be spent collecting data in the field, in other words on research EVAs? 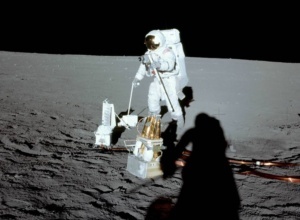 Apollo astronaut on the Moon (NASA image). The top priority for the crew is to stay alive, which means that the Mars station bust be kept operation. Experience with space stations from Skylab to the ISS suggests that this takes about two thirds of the crew’s work time, when all is going well. That means one third for science. Since the crew will be pacing themselves, that means at best two days a week on research activities per crew member. These two days will be divided between external research – exploring Mars – and internal research -living on Mars. Both are important. Monitoring how the crew adapts to living on the planet, experiments with growing plants, and studying how conditions affect various physical and chemical processes will pave the way for greater effectiveness on future missions and determine whether resource extraction and settlement are possible. So perhaps one research day a week would be dedicated to internal and external research, respectively. 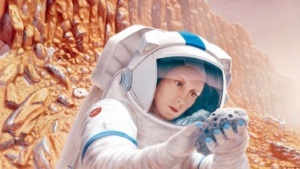 Artist’s conception of astronaut on Mars (Pat Rawlings/NASA). 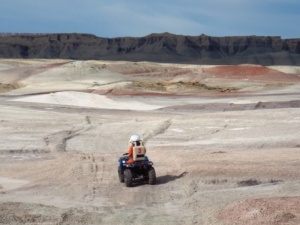 Excursions onto the martian surface involve more than throwing on a space suit and going outside. Each excursion has to be carefully planned and the equipment checked and tested. Afterwards the equipment will need further checks, tests and, if necessary repaired. Results from each excursion will need to be assessed and samples analysed, both in the station and on Earth. So realistically, perhaps that means a third of a crew day each working week will be spent on actual excursion. A working week for a four-person crew is 24 working days, while for a six-person crew it is 36 days. This translates into roughly two excursion days a week for the four-person crew and four excursion days for the six-person crew. Since each excursion will consist of two people that means that a four-person crew will be able to conduct one research excursion a week and a six-person crew two per week. 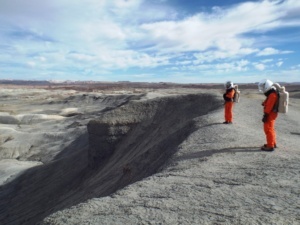 Mars 160 Crew member heading out towards Skyline Rim. How does this compare to historic rates? The last three Apollo missions averaged an EVA a day during their three-day surface stays. This was exhausting for the crews who recommended that future sorties to the Moon should involve EVAs every other day. 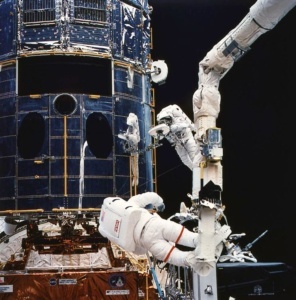 This practice was broadly followed during intensive EVA campaigns during servicing missions to the Hubble Space Telescope and assembly missions, for the ISS. Up to five EVAs were conducted during these one to two-week missions by six or seven–person crews. Two research excursions a week, plus an occasional engineering excursion. Mars 160 Crew members looking out across the desolate landscape of the Mars Desert Research Station field area. How does our Mars 160 mission experience compare? We are now in week seven and have conducted 29 excursions, an average of about four a week. Most of our excursions have been shorter that those expected on Mars, only two to four against four to eight hours, this is because of the high temperatures in our suits and the absence of water and toilet facilities. However the numbers of hours we are conducting are proving comparable to what is likely to be the case on an actual Mars mission. 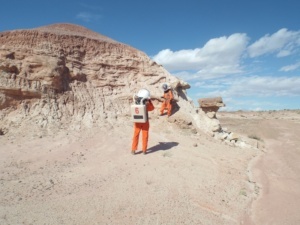 Mars 160 crew members studying outcrop.